By now most of you have heard the list of demands that Vermont Sen. Bernie Sanders has for Hillary Clinton, who is mainstream media’s “presumptive nominee” for the Democratic nomination. The list of course reads like a transcript of a speech from “A Future to Believe in” rally, a Bernie rally for those that don’t know. Bernie continues to hammer on the extremely realistic idea that America could actually have universal healthcare, like some of the countries we send billions of dollars in aid to, like I don’t know, say Israel for example. Free college is another of the well publicized talking points and it doesn’t seem likely to me or most other Sanders supporters that he is willing to budge on this. I’d be shocked if he accepted a solution like Clinton’s that “makes college more affordable”. There are many other core platform ideals as well that helped bring in millions of people across the country and powered the Sanders campaign in historic fashion. It’s no secret that Bernie is anti-war and very much anti-fracking, two other major differences between the two nominees. But what if she doesn’t move on these issues either? Tulsi Gabbard said recently that she’s “not prepared” to back Clinton and said there are a lot of areas that Clinton has hardly budged on throughout the length of this campaign. One in particular, is the failed regime change strategy that Clinton and her cronies are so in love with. But back to a nagging question that I have had for a while now. “What if Clinton doesn’t do the things Bernie wants her to do?” If I could ask Bernie one question right now, that would be it. Let’s throw out the fact that it would be hard to believe her even if she did say she would fight for these things but for the sake of argument, let’s pretend that her word is golden. Is Sanders prepared to play hardball with her and her campaign? Is he prepared to do whatever it takes to ensure a future we can all believe in? 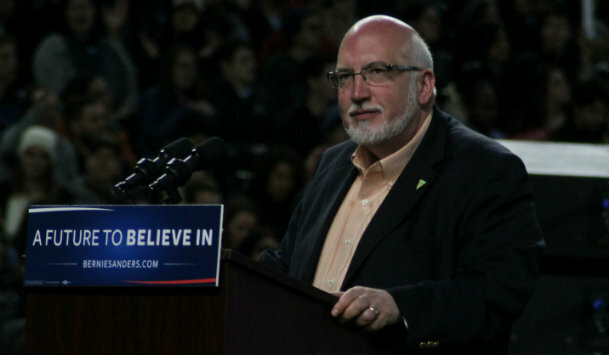 Based on an interview with Washington Post, Jeff Weaver alludes to the fact that the Sanders campaign has some options if Clinton does not move towards Bernie’s platform. But what are those options and can he even really show their cards? If one of the options is an escape from the Democratic party, he or Bernie surely couldn’t talk about it. So we speculate and dare I say, drool? On Thursday when Sanders addressed some 200K viewers via a live-streamed address he once again said he would work with Clinton to defeat Donald Trump. But he also did not endorse her, although many of the corporate media pundits would like to read between the lines, speculate and write condescending headlines and articles, crafted to further demoralize the people they so desperately need. If an endorsement hinges on her convincing Sanders that she will fight tooth and nail for progressive causes, that probably isn’t going to happen. But during the WaPo interview Weaver said that while it is preferable that Clinton and Sanders work together to defeat Trump he said there are other avenues for the campaign to take. What other avenues? Is he he hinting that Sanders would break from the Democratic party? Said Weaver, “that could be done independently of other campaigns,” speaking of course about the campaign’s promise to see that Trump is defeated and defeated badly. Done independently of other campaigns…things that make you go hmmmmmm. It’s no secret that a great many of supporters of Bernie Sanders supporters are urging him to play the “3rd party” card. TYT(The Young Turks) polled their viewers recently and a whopping 80% said they will not vote for Clinton, instead listing other options such as writing in Bernie’s name or voting for Stein, Libertarian candidate Gary Johnson and even some will ….gasp….vote for the Orange colored antichrist himself Donald Trump before voting for Clinton. On our Facebook page we’ve seen probably higher percentages of holdouts than that, so there isn’t much doubt that Sanders would be competitive in a third party role, much more than the spoiler role that the media and the Democratic establishment want you to believe would happen. And remember, if he was EVEN slightly thinking about going this route, he surely couldn’t tip his hand. To add more fuel to this very speculative fire is the fact that the Clinton machine has taken over the DNC and installed their people. I’m still wondering about that move though since she’s still only the “presumptive nominee”. Ex-progressive Howard Dean predicted yesterday that Clinton will be running the Democratic National Convention and I REALLY don’t think I need to tell you what that means.